Fishing has been very good for some over the past week. Rain will have helped cool the lakes significantly and top up some of the streams. All this will help the fishing no end. Rivers:- Have had a top up with cooling rain this past week and this will spur on some great fishing over the weekend. 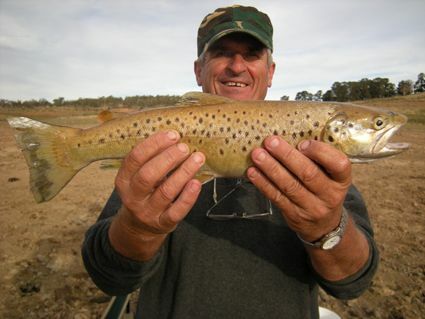 Best rivers will be the Thredbo which from all reports is really firing with some nice browns. Nymphs, hoppers and small emergeres on dark will be the best options. I promised to give you some feedback when I came through your shop on Feb 1st.Fished from Feb 2nd thru Feb 7th in the Gungarlin and Thredbo rivers. 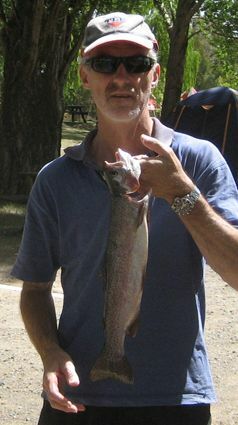 Gungarlin was fun with a few rainbows, but they were all small (less than 25cm). Only fished two sessions, late in afternoon and early morning. Then went to Thredbo river on the afternoon of the 2nd. Fished obvious easily reached spots for the first three sessions, some small fish were caught. Rain then set in, and we ventured further afield into areas that were difficult to reach. Fish size greatly increased, with 40cm, 45cm, and 55cm browns being taken. Smaller fish were also taken. All fish were returned to the wild. 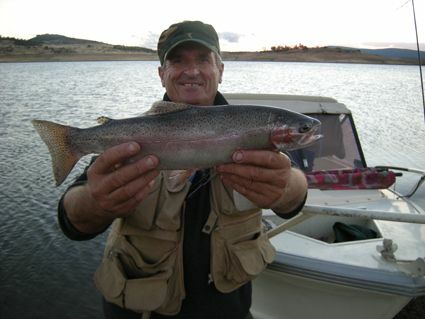 Lake Eucumbene:- Fly reports have been a little sporadic but there are stil some nice rainbows to be caught. Levels are still dropping at this stage but the fishing has not 'gone off' at all. *Ken Cain from Berridale had a good session late last week in the Middilingbank arm landing five well conditioned rainbows on a weighted scruffy. All fish fought very hard. Mudeye hatches should be good this week and with some good conditions the fish and fishing will be outstanding. 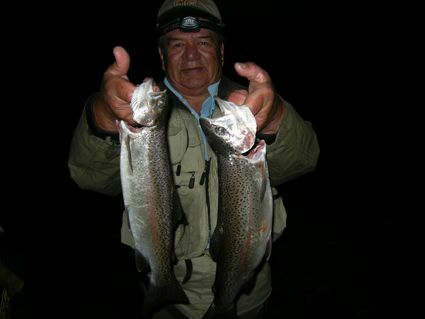 After dark with a Taihape Tickler or similar pattern should work, but you can also try cubits mudeyes, cordulids and the ever popular hivis mudeye. Black muddler minnows are also great fish takers after dark. Beadhead nymphs, scruffies and tom jones have been working during daylight hours. After dark mudeye and streamer patterns have been turning up a few too. 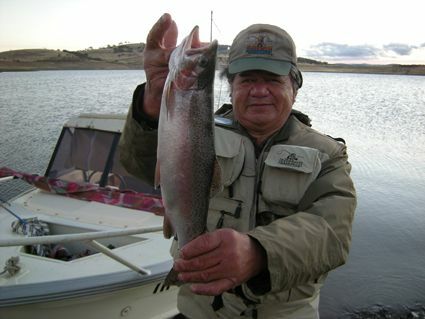 Lake Jindabyne:- Jindabyne reports have been quiet though the night fishing should be similar to Eucumbene with the cooler conditions and rain of the last few days. Eucumbene:- Eucumbene trolling reports have been scarce but the trolling is bound to be good after the rain. Small minnows and Tassie stlyed lures will do the job of taking a few rainbows. Early mornings in close should produce. One and angler did very well on large rainbow trout Rapalas while for others the standard Y82 and Y90 Tassoes did well. Strike Pro Vibes have continued to take a few also. Jindabyne:- Jindabyne has been good on the troll. *One group reported this week catching both good numbers and good sizes on five colours of leadcore. Tassies in Y82, 89, yellow Freddo, Y90, and 37 were the pick of the colours. 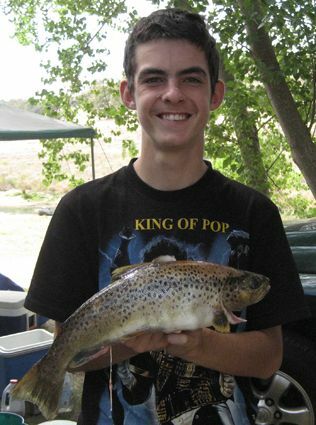 Had a great time fishing with my son Matthew at Jindabyne over the Australia Day long Weekend. Surprised ourselves by trolling up this nice brown on a tassie downrigging mid morning. Also caught quite a few rainbows. Even caught 2 on lead line late morning under a hot sun. So that shows you not to give up they are definitely there. Most were caught on downrigger though at around 40 feet. Can't wait to give Eucumbene a try over Easter. The bait fishing in Eucumbene has been very good with mudeyes taking their fair share of fish. Powerbait has also been good. Try Seven gates, Braemar, Yens, Buckenderra areas for best results. 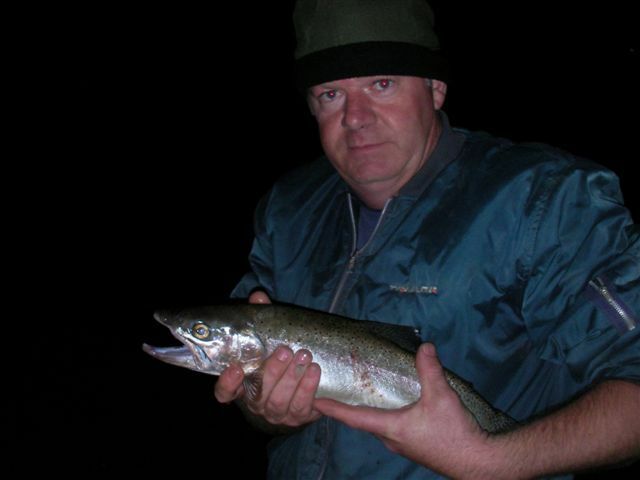 Fished White rocks on Friday night, and landed this sizable rainbow on green power bait at 11.00pm, fished and trolled the rest of the night and day with no more luck, fish measured 38cm. * Flavio Palmano and Johnny Scrubworm Pene pictured below with some of their recent captures from Eucumbene. Mudeyes were the baits used, though Johnny used the flies under a bubble for a couple of his. 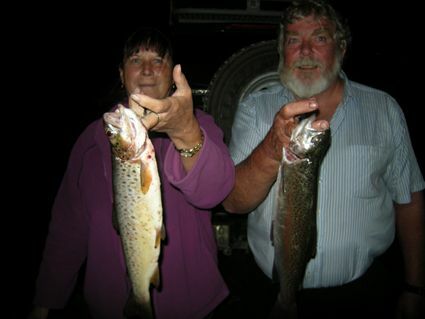 *Annie and Jeff Irons from Middle Arm Goulburn with two nice fish taken on the weekend in the Rainbow Pines area. Both were caught using mudeyes.